Explanation: Have you ever seen a halo around the Moon? This fairly common sight occurs when high thin clouds containing millions of tiny ice crystals cover much of the sky. Each ice crystal acts like a miniature lens. Because most of the crystals have a similar elongated hexagonal shape, light entering one crystal face and exiting through the opposing face refracts 22 degrees, which corresponds to the radius of the Moon Halo. A similar Sun Halo may be visible during the day. Exactly how ice-crystals form in clouds remains under investigation. 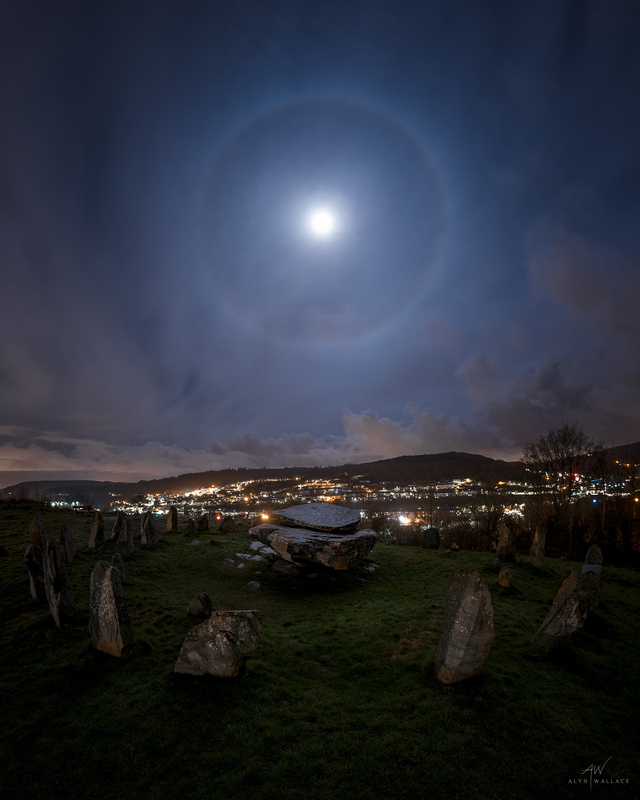 In the featured image, the ice circle in the sky is mirrored by a stone circle on the ground. Taken just over a month ago in Pontypridd Common, Wales, UK, the central Rocking Stone survives from the last ice age, while the surrounding stones in the circles were placed much more recently -- during the 1800s.